Written by VOANews on November 17, 2015 in Europe - Comments Off on Can the Balkans kick its jihadi habit? The video is one of many “Mujatweets” – slickly produced clips published by the Islamic State’s media operation. This one targets the Balkans. Across the Balkan region, security officials say there is a war on for hearts and minds, and children are often the targets. Hundreds of citizens – mainly from Bosnia and Kosovo, a few from Serbia, Macedonia and Albania – have gone to fight in Syria. There are no set answers to why Balkan citizens are lured to radical Islamist ideology, but there are some common themes. Many blame the region’s dysfunctional politics and post-war economic deterioration. In Bosnia, the unemployment rate for the 15- to 24-year-old demographic is 63 percent – the highest in the world. In Kosovo, it is around 30 percent. The result is an overall feeling of disenfranchisement and helplessness. Azinovic says radical Islamist ideology often fills the vacuum. Many who have gone to Syria to fight come from broken homes with little or no parental guidance. The Islamic State’s well-versed media machine is spewing out this absolutism constantly. Its official sites are blocked, so the group uses search terms and hashtags to share its publicity information with would-be followers. It has a regular stream of highly produced videos, some shocking and violent. Others depicting the “romance” of the jihadi lifestyle are readily available for those who are looking. A former member of the Bosnian Mujahedeen and al-Qaida, Aiman Dean, says 20 years ago, radicals spread their message face-to-face, often in small groups. The Internet has changed that. In lectures from his stronghold in the Bosnian mountains, posted on YouTube, he told followers that killing infidels, or non-Muslims, would absolve them from any previous sins. At least six Bosnian citizens who attended his lectures are known to have died in Syria; others still remain there. The concern for security officials around the region is what happens when these fighters start returning home with military weapons and explosives training? 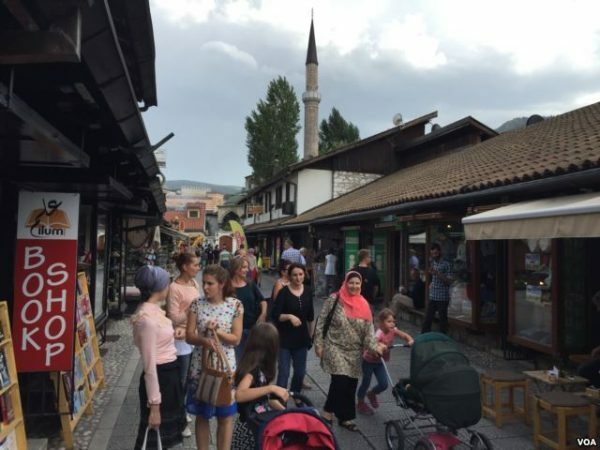 “My concern is what if they decide the jihad is now in Sarajevo, in Banja Luka or Mostar,” said Vjekoslav Vukovic, Bosnia’s deputy minister for security. Communities around the region are starting to fight back against violent extremism. In a classroom at the Bahri Haxha High School outside Pristina Kosovo, students are tested on how groups like IS and the al-Nusra Front recruit young people. Sitting in groups of eight around small tables with pads of paper and markers, they write down the arguments extremists might use to entice them. Each group of students brings a list of arguments to the front of the classroom and a discussion ensues. Perteshi and his staff throw out a counternarrative for each of the arguments the students have written down. Perteshi says the problem of extremism can only by solved by society as a whole – meaning government institutions, schools, NGO’s and, most importantly, the religious community must be marching to the same beat. 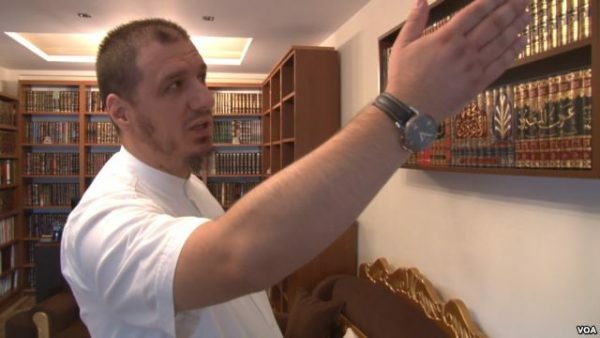 In Mitrovica, Kosovo, Imam Enis Mama has been fighting extremism for years. He has talked several at-risk youth out of traveling to Syria. “There are many challenges for the youth here,” he says. “There are not enough opportunities to keep them busy. The imam says a big part of countering extremism is deconstructing the militants’ message. Security officials whom VOA talked to admit the region has been slow to react, but they say they are moving forward. VOA’s Jeff Swicord visited Bosnia, Herzegovina and Kosovo to examine radical extremism in the Balkans. This is the first of three parts. Part 2: How the 1990s Bosnian War helped create today’s militant extremists. Part 3: A young Kosovar traveled to Syria to fight the Assad regime, but left disillusioned.